Jules Mattsson, a 15-year-old photographer, challenged police officers attempting to restrict his photographing of an Armed Forced Parade in Romford on Saturday. As the recording posted to YouTube demonstrates, Mattsson was unrelenting in asserting his rights to the policeman, who eventually resorted to telling him he was a “threat under the terrorism act” and confiscating his camera. Mattsson can then be heard accusing the officer of pushing him down a flight of stairs. 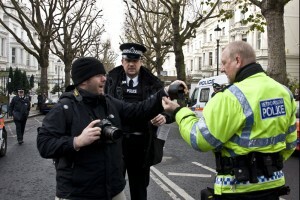 Especially poignant this incident took place the day after photojournalist Marc Vallee and videographer Jason Parkinson won their case against the met for an incident outside the Greek Embassy where Marc had his camera grabbed and Jason had his lens covered by an armed police officer. Many have hailed this ruling as ‘a victory for press freedom’, and I would be inclined to agree. However, until the met’s guidance on photography and a clearer understanding of the law filters down to the streets, we will continue to see incidents like this. Read more on the Marc Vallee/Jason Parkinson case on Journalism.co.uk. This entry was posted in Photography, Press freedom and ethics and tagged jules mattsson, Met Police, Photography, press freedom, Terrorism Act on June 29, 2010 by Joel Gunter. The advice covers section 44, section 43 and section 58a of the Terrorism Act 2000 (58a is more commonly known as section 76). On sections 44 and 43, the MPS say that “officers have the power to view digital images contained in mobile telephones or cameras carried by a person searched”. Vallée says that guidance for section 76 of the Counter Terrorism Act 2008, which came into force at the beginning of this year, is key. The MPS advice says that section 76 (58a) “should ordinarily be considered inappropriate to use… to arrest people photographing police officers in the course of normal policing activities, including protests”. This entry was posted in Editors' pick, Photography, Press freedom and ethics and tagged comment is free, Frontline Club, G20, Great Britain, Guardian.co.uk, intelligence services, Journalism.co.uk, Marc Vallee, Northern Ireland, photography guidelines Photojournalist, police officer, section 76, Terrorism Act, terrorism act 2000, The Guardian on July 9, 2009 by Judith Townend. The British Journal of Photography (BJP) is covering the photographic ‘event’ against the new Counter-Terrorism Act 2008, which comes into force today, with live updates and images posted to Twitter. The National Union of Journalists (NUJ) is also supporting the action against the act, which makes photographing a police constable (“Eliciting, publishing or communicating information about members of armed forces etc”) an offence. This entry was posted in Photography, Press freedom and ethics and tagged Journal of Photography, London, National Union, police constable, Scotland Yard, Terrorism Act, The British Journal, Twitter on February 16, 2009 by Laura Oliver. 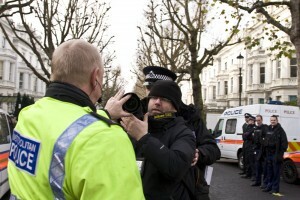 Photographers reporting on a blockade of the Greek Embassy by Greek and British anarchists in London on Monday 8 December found themselves in conflict with police officers at the scene. 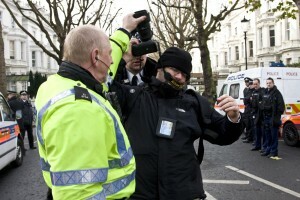 These photographs by Philip Caller (his other photos of the protest can be viewed here) document a police officer grabbing and lifting up photographic equipment hanging around the neck of photojournalist Marc Valleé. Vallée, who has featured on Journalism.co.uk before in regards to his investigation of rights under the Terrorism Act 2000, also publishes the photos on his blog. This entry was posted in Photography, Press freedom and ethics and tagged Greek Embassy, Journalism.co.uk, journalist rights, London, Marc Vallee, media rights, Philip Caller, photographic equipment, photography equipment, photojournalist, police, police officer, press freedom, Terrorism Act, www.flickr.com/photos/filkaler on December 10, 2008 by Judith Townend. This entry was posted in Editors' pick, Photography, Press freedom and ethics and tagged terrorism, Terrorism Act on December 2, 2008 by Laura Oliver.